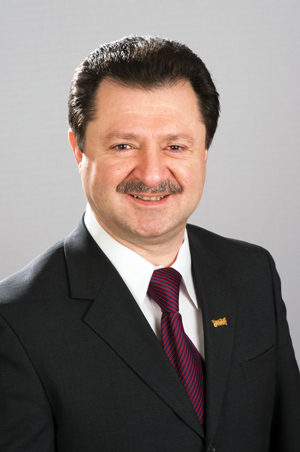 Dr. Juri Gelovani came to Wayne State in 2012 from the University of Texas’ M.D. Anderson Cancer Center in Houston, where he was a full professor and chairman of the Department of Experimental Diagnostic Imaging and director of the Center for Advanced Biomedical Imaging Research. He also served on committees for science faculty, small animal cancer imaging research, on the faculty of the Brain Tumor Center, and with the Stem Cell Multidisciplinary Research Program. Dr. Gelovani is the pioneer of molecular-genetic in vivo imaging. His research interests include molecular PET imaging of cancer and the central nervous system using newly developed radiotracers, genomics and proteomics for cancer therapy, adoptive immunotherapy and regenerative stem cell therapies. He holds more than 15 patents, has published more than 160 papers and book chapters, and edited a major book in molecular imaging in oncology. Additionally, several diagnostic imaging compounds he developed are currently in clinical trials in cancer patients. Dr. Gelovani received the International Fellow Award from the Alexander von Humboldt Foundation, the George and Barbara Bush Endowment for Innovative Cancer Research, and the Gold Medal for significant contributions to the field of molecular imaging from the Society for Molecular Imaging (SMI). Dr. Gelovani was president of the SMI and the Academy of Molecular Imaging, for which he received service awards. Dr. Gelovani also was president of the World Molecular Imaging Society. He is a member of several grant review study sections at the National Institutes of Health, an associate editor of Molecular Imaging and Biology, and one of the academic editors of PLOS One. Dr. Gelovani was recognized for spearheading the development of a triage center in Hoboken, N.J., and leading the emergency medical team for decontamination and treatment of the most severely injured victims of the Sept. 11, 2001 terrorist attacks on the World Trade Center in New York. Dr. Gelovani earned both his MD (1986) and PhD (1990) in neurosurgery from the University of Tartu in Estonia. He completed his postdoctoral fellowship at the Memorial Sloan-Kettering Cancer Center in New York City (1991-1996). Some of his many speaking engagements in 2012 alone included an invited plenary lecture on the topic “Molecular imaging of intra- and inter-tumoral heterogeneity for selection of individualized therapies” at the 10th anniversary conference of Korean Society for Molecular Imaging, and an invited lecture at the Herrenhausen Symposium on Metastasis in Germany. He also attended the 2012 World Molecular Imaging Congress in Ireland as the organizer-in-chief and past president of the World Molecular Imaging Society.